Higuain, the Juventus striker, takes on his former club at The Principality Stadium in Cardiff. JAVIER SORIANO / AFP / GETTY IMAGES. Juventus are a typically Italian side: they’re going to be strong defensively. There’s not much pace in that back line, but lots of experience and toughness. Real Madrid have got a lot of individual flair — players who can just turn it on. One v one, that can be hard to defend, so I think that Juventus will try to defend as a team and squeeze the space, and try to prevent those individuals enjoying time on the ball. 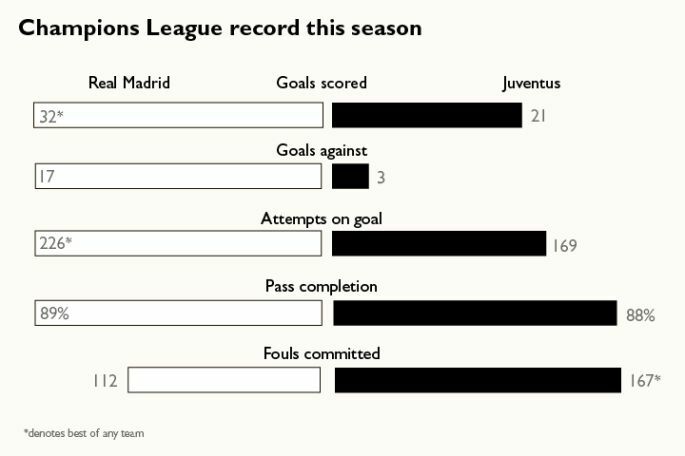 But of course, Juventus have got to score as well, so it may be that when they are on the front foot, that’s when Real Madrid will get a little bit more joy. How do you stop Ronaldo? Ronaldo is very difficult to stop because he can score all types of goals. He could do nothing in open play but then score with a header from a dead-ball situation or direct from a free kick. His movement is really good — he’s changed his game from when I was playing with him, when he was a winger who just liked to take players on, to an out-and-out goalscorer. You’ve got to try to cut off the supply because once he’s in the box he can run near post, back post for headers, cutbacks on his right or left foot. I think his best chance of exploiting the lack of pace in Juventus’s back three is when Juventus are attacking — that’s when there may be space for him to run in behind. Isco’s in good form: he played really well in the semi-finals against Atletico. He is a talented player, but I think Gareth is a step above that: he belongs in the world-class bracket, and at times he can be unstoppable. I think a fit Bale, with games under his belt, would always start. But given Isco’s form and that Bale is returning from injury, I think Zinédine Zidane will go for Isco. If they need an impact off the bench, Bale can come on for the last half-hour and change the game. The four full backs — Real Madrid’s Dani Carvajal and Marcelo, and Juventus’s Dani Alves and Alex Sandro — are all attack-minded. They’re very comfortable in the final third, and there could be space out wide in this game, so they could be very important in exploiting that. But by the same token, they could leave space in behind. Luka Modric and Toni Kroos usually look as if they’ve got all the time in the world and that’s what good players do. Juventus must not give them time on the ball; it’s a whole team effort. The Argentinian, signed last summer for £76 million, leads the line for Juventus but he made his name in six seasons at Real Madrid. Despite scoring 121 goals in 264 appearances he struggled for regular appearances owing to the signings of Cristiano Ronaldo and Karim Benzema and in 2013 moved to Napoli, where he scored 71 league goals in 104 appearances. Higuaín may well be joined in the the side by another Real old boy, Khedira, the Germany midfielder. He struggled with injuries in five seasons at the Bernabeu — and suffered a knock in the semi-final — but was highly regarded by his managers until being forced out of the side by Luka Modric and Toni Kroos. He was allowed to join the Italians on a free transfer in 2015 and has been a key member of the side this season, sitting deep to allow the attacking talents of Paulo Dybala and Mario Mandzukic to flourish.